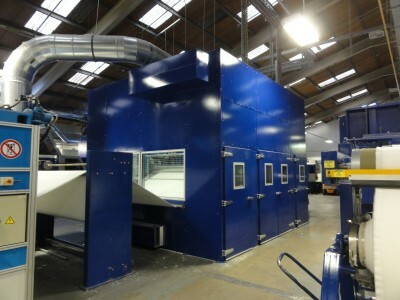 Acoustic enclosure for a Needle Loom on a production line manufacturing high-specification non-woven media. The Needle Loom operation produces noise levels up to 105dB(A) with a characteristic ‘drumming’ noise that led to noise complaints from a number of nearby residential properties. The design, manufacture, delivery & installation of the required enclosure, this being sized at approximately 5.2m long x 4.8m wide x 4.1m high. 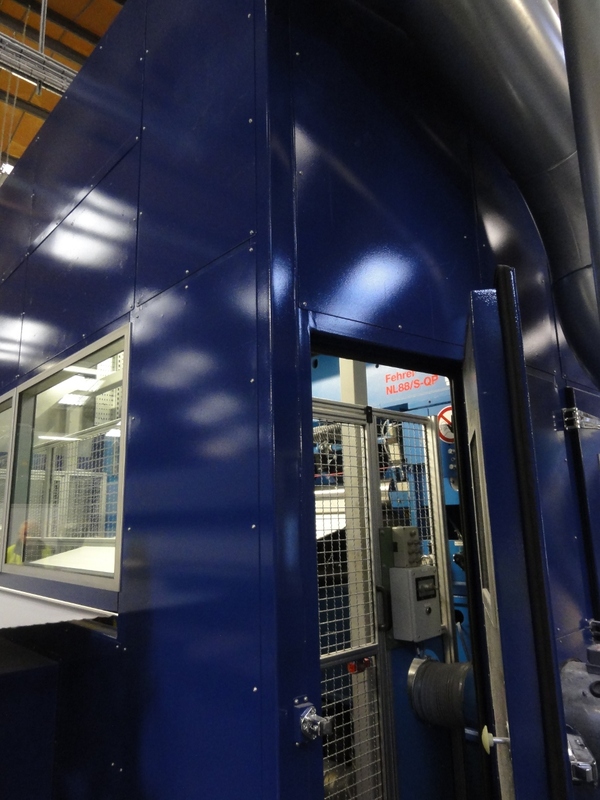 Purpose built enclosure designed such that it integrates with the existing production line, and utilises a minimal amount of space around the machinery, thus ensuring that adjacent passageways are clear for personnel and forklift access. Impulsive, low frequency noise attenuated using high mass panels with acoustically absorptive inner surfaces. Entry / egress points for the non-woven media, and numerous other sealed service apertures to accommodate the necessary extraction system ductwork, cables, wires etc. Two double door sets facilitating access to the needle boards, and four single man access doors for full access to the needle loom machinery; all doors double sealing at the header, jambs and sill; all doors equipped with duel glazed vision panels and acoustically lined reveals. 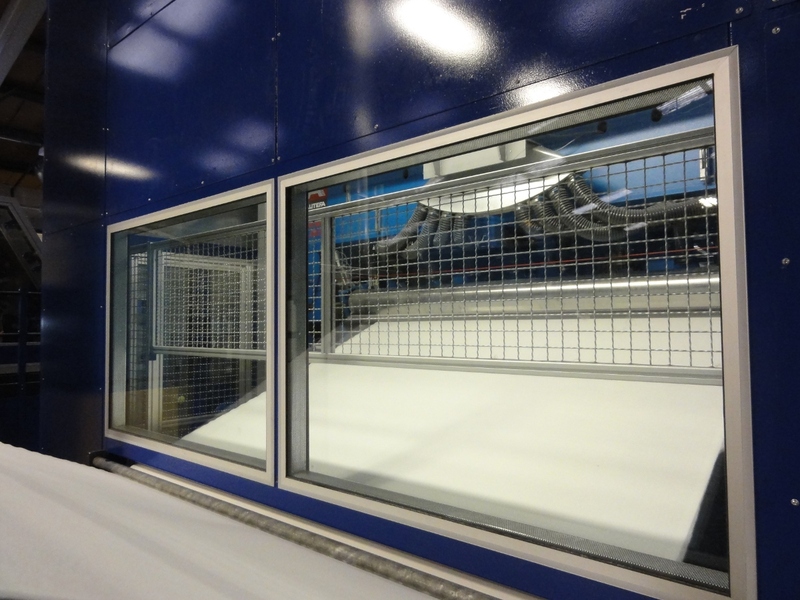 Vision panels above media entry / egress points, permitting operators to monitor the production process, again all dual glazed and their reveals acoustically lined. 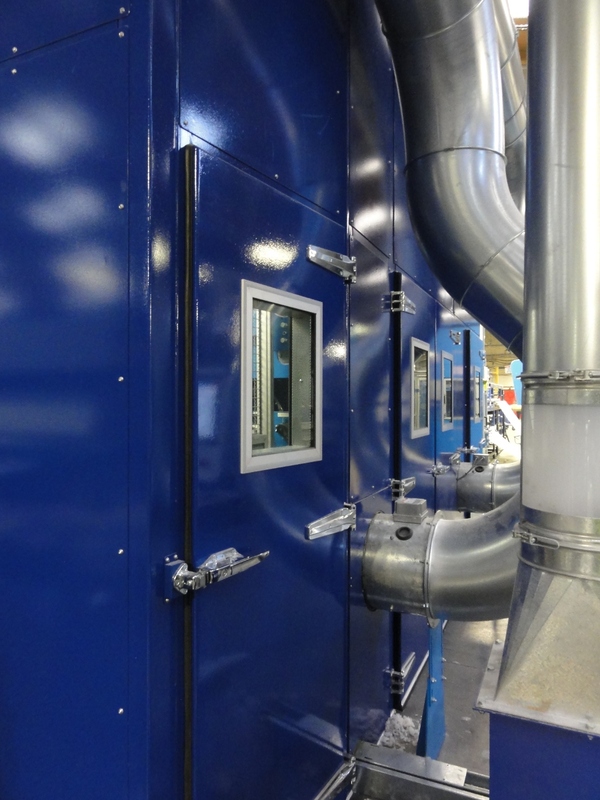 Adequate ventilation to prevent the anticipated heat build-up from adversely effecting machine operation, the ventilation system comprising of an extraction fan at high level (regulated by a temperature sensor and inverter/speed control), two air inlets at low level and one air inlet placed specifically to provide cool air to the main drive motor; all inlets suitably attenuated, thus maintaining the acoustic integrity of the enclosure. Enclosure finish in a colour compliant with the end users corporate colour scheme. Rigid installation schedule with minimal machine downtime, thus minimising any impact on production. 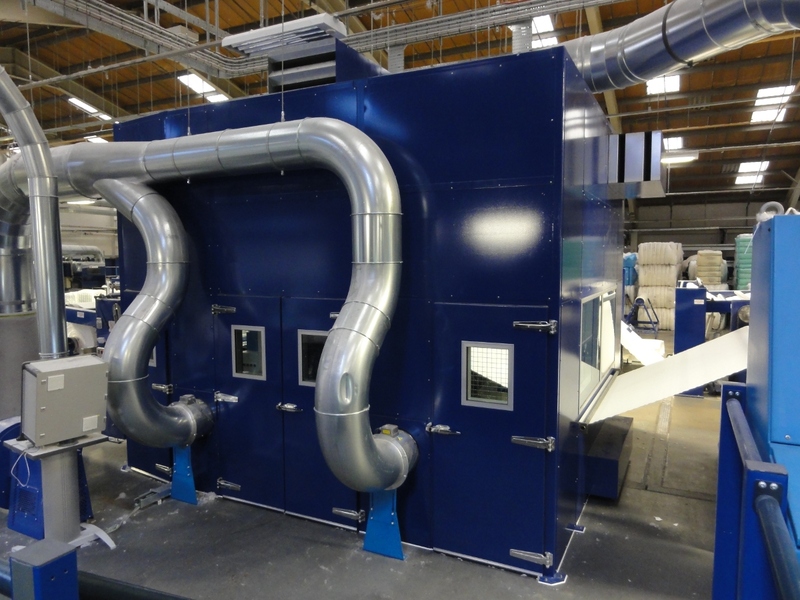 The enclosure achieved the required reduction in airborne noise levels and dealt with the characteristic 'drumming' noise, ending noise complaints from nearby residents, and satisfying the machinery operatives by improving their working environment.